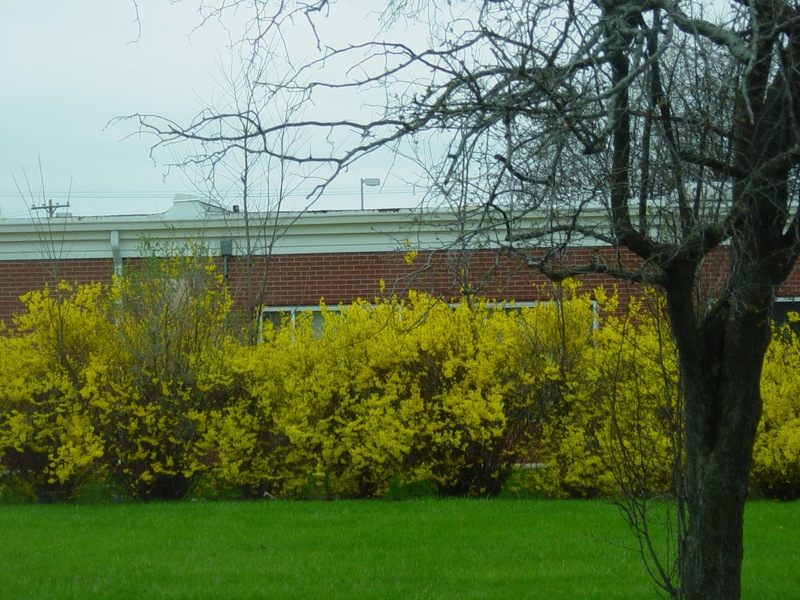 A beautiful row of forsythia. I love it growing natural, not trimmed back. It just seems to have more flowers that way. 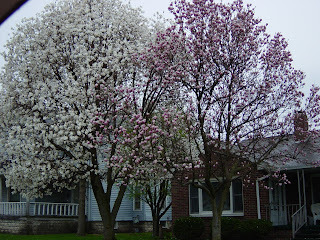 I know the pinkish tree is called a magnolia tulip. 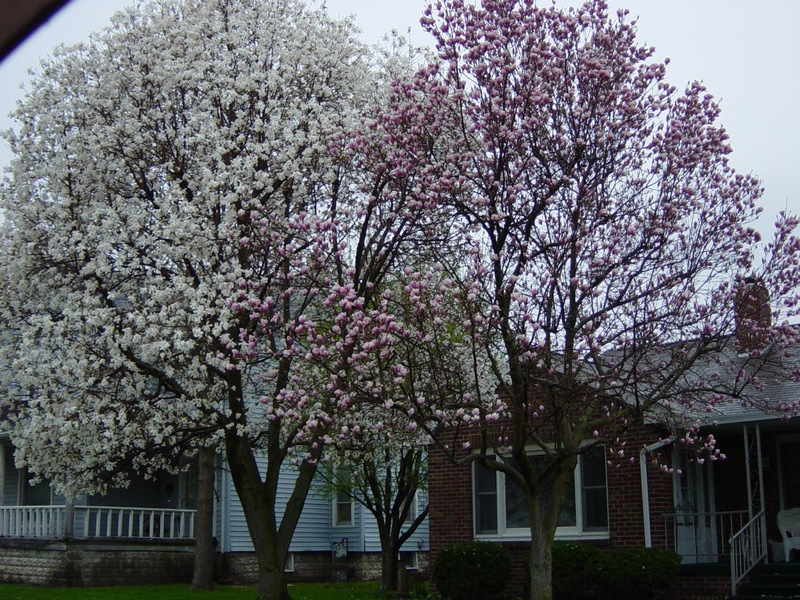 I am not sure what the white flowering tree is called. I do know it's not a fruit producing tree. They look so pretty all bloomed out....you all know the blossoms do not last long on the trees. Hope you are seeing some spring weather and flowers in your area. I met the new doctor, Jesse Spear, yesterday. Great bedside manner. Young, but with 11 years in his field already. Gave me a check up. Ordered a mammogram and bone scan. Then took me off my cholesterol meds for a couple weeks ...then we'll do a blood work up and he will lower my dosage. Hooray. I have told the last two drs. that I thought my dosage was a bit high. I take two pills a day...one for cholesterol, one for reflux. I also take a fish oil and vitamin for women. Yes he told me to keep exercising and eating healthy....well blast, there goes my sweet treats. I told him the internist told me to lose 20 pounds, Dr. Spear said, "well did you?" I said , "no I just got a new dr. ".LOL...I don't think he thought that was funny. Hmmm? But I do like this young doctor and hope he will stay in our town for many years. This pictures is a couple years old....but this is the two daughters I was with yesterday. Just as it looks in this photo...we laughed a lot. 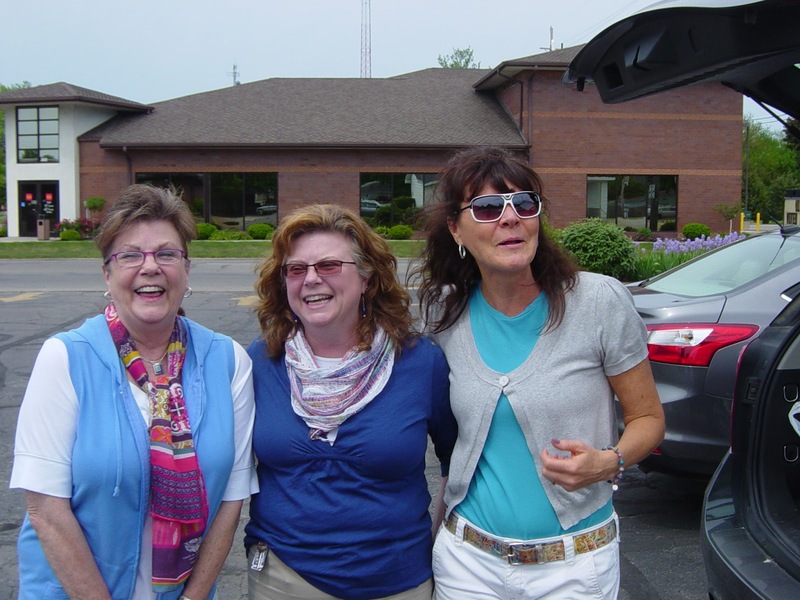 I rode to Kokomo with Kathy(blue top) , so we could have a chance to talk a bit and Angie followed us in her car. The reason we did that was Kathy would be headed home and it saved her 40 miles. We shopped Kohl's ,T.J.Maxx, and a couple shoe stores. Then had lunch at McAllisters. I knew Kathy had a two hour drive back home, but I still hated to say bye. When Kathy got home she texted me that she had arrived safely and there was not much traffic, so she made good time. Then she texted that she had my camera in her car. I had forgotten it. I had even forgotten I took it....because I was going to get some pictures of us out together. I almost felt sick. I love having my camera at hand. So next week Ted and I will be going to Shipshewana..as Kathy lives near there. I will get my camera first then I can take photos in the Amish area. We had a fun time , that went by way to quickly. I had a wonderful Easter with my family. Hope all of you did as well. Today, I will meet a new doctor. Hoping to find a family doctor. Ted has meet him and liked him very well. This is what our skies looked like on Friday. So blue and puffy white clouds. None of the farmers around have been in their fields yet...too early and probably a bit wet. But it is to rain again tomorrow, Easter Sunday. Friday evening's sunset. I almost missed getting a shot. Took this from the porch. Drove thru town today(Saturday). The skies are clear. The flowering magnolias are blooming. I like the deep pink color of this magnolia against this apartment building with it's green walls and brown accents. Got this shot as I drove by. So much traffic for our small town today. Maybe people were getting their Easter things. Food for a Sunday dinner and possibly candy eggs for kids. It was so nice to get out and drive thru my town. I'll always love it. When Emma was here, we made this wreath for her mom , for Easter. Use the lid off the take home pizza box. :):) Cut into a circle..Cut strips of an old church hymnal's pages. Bits of fake apple blossoms....or any pretty fake flowers you may have already. Glue the strips of paper around the pizza lid ring. Tie on the flowers with any pretty ribbon. We made this in a hurry, as it was nearing time for Emma to go home. But her mom loved it. It's a quick craft for kids. Doesn't take much. You could use any pretty scraps of paper also. This willow tree is green and the skies are partly cloudy. We had a nice day yesterday...windy again. It did warm up later in the day. The lilies by the pond are much taller. The ones on the west side of the house are also. They look much better once I cleaned all the old streamers out from last year. Emma's dad got this new big old rooster. He's very pretty with teal colored tail feathers. I do not know breeds of chicken...so I can not even begin to tell you. He's tall too. Emma sure does like the chickens and gathering eggs. Liz did tell me what the new chickens' breeds were, but I do not remember..she said one kind lays blue eggs. Can't wait to see those. Emma painted a little stick we found. She chose pink to go with the colors on the container we were going to use for planting some pansies. This is the cute pot we planted the pansies in for Emma's mom ( my daughter LIz.). Emma picked these two colors of pansies. Since one was a bit floppy and taller, that is where the painted stick was inserted . It holds up the taller pansy. Emma also decided she needed her rummage sale cats for it. So they are going home with her today. Papaw was going to have Emma help roll the lawn....but it was too dry. So they just rode around on the golf cart. This is how Emma drove, LOL. You can see the marks of the tires. I am not sure she understands the steering wheel to road wheels connection. :):) We had some good laughs. This was some of what we did on Monday. It was almost bitter cold, the wind had a bite to it. Today is to be very windy, so we won't be outdoors much. I want those nice warm days back, don't you? Savannah and Emma talking together at aunt Angie's. Savannah will be 14 this week. I remember her walking around poking things with a little stick. ...how can she be 14 ?? There will be a party later this week. She's into coloring her hair ...a little more extreme than I do mine. LOL Those phones !! ever at the ready. Savannah's hair goes with my top and my hair looks flat and Emma's hair is shining as I had just washed and combed hers before we went to Angie's. Look how tall those girls are. I am 5'4". I will be the shortest in the family one day. This is Emma two years ago....she was ten. Next month our baby granddaughter will be twelve. Time has grown wings. Some times I wish it would slow down. Emma is into art...which I love. She's been drawing in her sketch books for about a year now.. This is a robin she drew for me last evening. I am sure she'll make some more fun things while here. The sun rise shining thru the office window. Let's get this day started. Went to bingo with my sisters. Had a fun time. Grabbed some lunch, brought it home to eat. By now it noon. Throw in a load of laundry then go outside. I decided to clean out the remaining flowerbeds. This is the backyard. You can see the big wood box we keep at the back door for easy access to wood thru the winter. It gets filled many times throughout the season. It's time for it to be hauled to the wood pen. Now evening has arrived. I loved the pink cast on this big puffy cloud. The end of the day brought us a beautiful sunset. Yesterday was pleasant and turned out to be a good work day for me. I felt tired but happy about things looking better around the yard. Today, I will finish some other chores around here...such as laundry...who is wearing all these clothes? Do you ever ask yourself that? Where I picked up lunch yesterday, the manager asked me what I was going to do after lunch..when I said laundry she laughed and said she always has laundry. Then tells me 3 of her grandkids live with her. Yes, I bet she has unending laundry. I do remember those days of having four daughter at home. :):) Talk about laundry !!!! Of course they helped me plenty. You know where these pictures were taken. LOL. I love the old mirror. Never ever throw away an old mantle. Hortons uses theirs in so many of their decorating displays. I just now spotted the little white pitchers hang from the mantle...will have to go back and check them out. I love these lamps. I wanted you to see the framed wire , where pictures are hung. Cute idea for crafters. Grapevine spheres hanging from an old ladder. I think the old the ladder for decorating , the better. This serving spoon says"The Sweet Life" on it. This makes me think it's s dish and spoon for serving after dinner mints.. Do people do that any more? There's a wreath hanging from the china cabinet. It appears to be a bent hanger, in a heart shape, with bits of cloth rags tied to it, along with some ribbons...sweet. I think we all could make one of these. What I liked about this tiny cabinet was the candle pedestals. They would be so nice in vignettes , placing some things a bit higher to be seen. This half barrel is at the side door of Horton's and always decorated. I really liked this, with it's colorful pansies , teacup/saucer, and small garden flag. I think there's a tiny evergreen to the back. So pretty. Picked up my flat of pansies from Horton's. I decided on some of the big soft colors too. This is the little viola, the one that bloomed thru the snow and ice of late Jan . and Feb. I think you may remember it was in the bricks. I dug it from where it planted itself and put into a pot. The other green stuff is pachysandra(Ground plant). I put that in for added greenery. This pot has two 10 cent cats, I bought for Emma at a yard sale last year. I thought she might like them in this container when she comes over. I stuck some of the painted sticks from last year in the container along with seashells in this one. 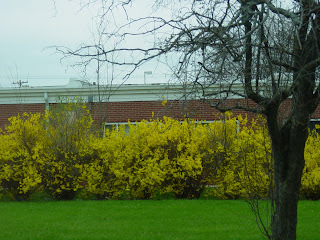 During a walk around the yard , I spotted leafy growth on the lilac bushes. The lilies on the west side are really growing fast with the warmer temperatures. Hope that snow coming doesn't hurt them. You can see the green haze of the willow tree. Look at the blue skies. This is yesterday's sunset. It was a wonderful day and had the best warm air. Ted and I sat on the porch for a short time. I told him after doing just two planting of containers I will wait till next week to finish. I will put the flowers under the covered part of the porch...even though I know pansies are hardy. The winds today may be fierce. Hope no to much.